India is densely populated and has high solar insolation, an ideal combination for using solar power in India. In the solar energy sector, some large projects have been proposed, and a 35,000 km2 (14,000 sq mi) area of the Thar Desert has been set aside for solar power projects, sufficient to generate 700 to 2,100 GW. Also India's Ministry of New and Renewable Energy has released the JNNSM Phase 2 Draft Policy, by which the Government aims to install 10 GW of Solar Power and of this 10 GW target, 4 GW would fall under the central scheme and the remaining 6 GW under various State specific schemes. According to a 2011 report by BRIDGE TO INDIA and GTM Research, India is facing a perfect storm of factors that will drive solar photovoltaic (PV) adoption at a "furious pace over the next five years and beyond". The falling prices of PV panels, mostly from China but also from the U.S., has coincided with the growing cost of grid power in India. Government support and ample solar resources have also helped to increase solar adoption, but perhaps the biggest factor has been need. India, "as a growing economy with a surging middle class, is now facing a severe electricity deficit that often runs between 10% and 13% of daily need". India is planning to install the World's largest Solar Power Plant with 4,000 MW Capacity near Sambhar Lake in Rajasthan. There are various factors that we need to consider before investing into a solar power plant. A lot of enthusiasm has been seen among people about the use of Solar Energy as a substitute of conventional sources of energy. However, currently, with the power subsidies in India, solar works economical only in those areas that are using diesel generators as a primary source of electricity. The entire payback is made in 2-3 years. Solar system for petrol pumps is a leading example of such an application. IOCL is leading the race for solarization of petrol pumps with aggressive targets. Solar applications for petrol pumps by RelyOn Solar has been installed in more than 150 IOCL petrol pumps across India and now other oil companies are also looking to solarize their ROs. Solar installations for commercial buildings, where the electricity rates are higher, are also proving to be a game changer for the owners of IT companies. On 16 May 2011, India’s first 5 MW of installed capacity solar power project was registered under the Clean Development Mechanism. The project is in Sivagangai Village, Sivaganga district, Tamil Nadu. With about 300 clear, sunny days in a year, India's theoretical solar power reception, on only its land area, is about 5000 Petawatt-hours per year (PWh/yr) (i.e. 5,000 trillion kWh/yr or about 600,000 GW). The daily average solar energy incident over India varies from 4 to 7 kWh/m2 with about 1,500–2,000 sunshine hours per year (depending upon location), which is far more than current total energy consumption. For example, assuming the efficiency of PV modules were as low as 10%, this would still be a thousand times greater than the domestic electricity demand projected for 2015. The amount of solar energy produced in India in 2007 was less than 1% of the total energy demand. The grid-connected solar power as of December 2010 was merely 10 MW. Government-funded solar energy in India only accounted for approximately 6.4 MW-yr of power as of 2005. However, India is ranked number one in terms of solar energy production per watt installed, with an insolation of 1,700 to 1,900 kilowatt hours per kilowatt peak (kWh/KWp). 25.1 MW was added in 2010 and 468.3 MW in 2011. 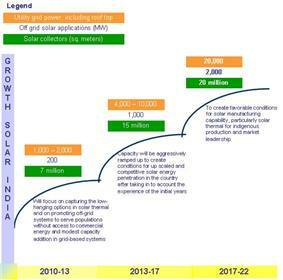 By January 2014 the installed grid connected solar power had increased to 2,208.36 MW, and India expects to install an additional 10,000 MW by 2017, and a total of 20,000 MW by 2022. Azure Power - Sabarkantha, Khadoda village, Gujarat  10 02011-06-01-0000 Commissioned June 2011, 63 acres, using 36,000 Suntech Power panels. Gujarat has been a leader in solar power generation and contributes 2/3rd of the 900 MW of photovoltaics in the country.The State has commissioned Asia’s biggest solar park at Charanka village. The park is already generating 2 MW solar power out of its total planned capacity of 500 MW. The park has been functioning on a multi-developers and multi-beneficiaries paradigm and has been awarded for being the most innovative and environment-friendly project by the CII. With a view to make Gandhinagar a solar city, the State government has launched a roof-top solar power generation scheme. Under this scheme, the State plans to generate five megawatt of solar power by putting solar panels on about 50 state government buildings and on 500 private buildings. The State has also a plan to emulate this project in Rajkot, Surat, Bhavnagar and Vadodara in 2012-13. The State plans to generate solar power by putting solar panels on the Narmada canal branches. As a part of this scheme, the State has already commissioned a one megawatt solar plant on a branch of the Narmada Canal near Chandrasan area of Anand taluka. This also helps by stopping 90,000 liter water/year of the Narmada river from evaporating. The Welspun Solar MP project, the largest solar power plant in India set up at a cost of Rs. 1,100 crore on 305 hectares of land, will supply power at Rs. 8.05 a kWh. The project of a 130MW solar power plant at Bhagwanpur in Neemuch was launched by Gujarat chief Minister, Narendra Modi. “Ujaas Energy Limited , an Indore based company which is listed on BSE /NSE . It has installed over 105 MWs in five solar parks viz. , Rajgarh , Barod, Ichchhawar , Rojhani and Susner , in Madhya Pradesh . The company is proud to be backed by Mr Amitabh Bachhcan who holds 1.6 % stake according to latest filing. Ujaas is the pioneer of solar REC Mechanism in India". Apart from company’s innovative PLUG & PLAY Ujaas Park model where it provides an end to end solution to the investors , the company has also done substantial solar roof top installations in Chennai ,UP,AP,( Noida,Greater Noida )Delhi/NCR region etc... under the allocation from SECI-Phase-II and under JNNSM. Ujaas has ranked at No 2 as India’s Fastest Growing Company by a renowned magazine on Renewable Energy , Business World . The company has made it onto prestigious Forbes Asia's 200 Best Under a Billion dollar Companies list.”. Lack of electricity infrastructure is one of the main hurdles in the development of rural India. India's grid system is considerably under-developed, with major sections of its populace still surviving off-grid. As of 2004 there are about 80,000 unelectrified villages in the country. Of these villages, 18,000 could not be electrified through extension of the conventional grid. A target for electrifying 5,000 such villages was set for the Tenth National Five Year Plan (2002–2007). As of 2004, more than 2,700 villages and hamlets had been electrified, mainly using solar photovoltaic systems. Developments in cheap solar technology are considered as a potential alternative that allows an electricity infrastructure consisting of a network of local-grid clusters with distributed electricity generation. It could allow bypassing (or at least relieving) the need to install expensive, lossy, long-distance, centralized power delivery systems and yet bring cheap electricity to the masses. India currently has around 1.2 million solar home lighting systems and 3.2 million solar lanterns sold/distributed. Also, India has been ranked the number one market in Asia for solar off-grid products. Projects currently planned include 3,000 villages of Orissa, which will be lighted with solar power by 2014. By 2012, a total of 4,600,000 solar lanterns and 861,654 solar powered home lights had been installed. These typically replace kerosene lamps and can be purchased for the cost of a few months worth of kerosene through a small loan. The Ministry of New and Renewable Energy is offering a 30% to 40% subsidy for the cost of lanterns, home lights and small systems up to 210 Wp. 20 million solar lamps are expected by 2022. Solar PV water pumping systems are used for irrigation and drinking water. The majority of the pumps are fitted with a 200–3,000 watt motor that are powered with 1,800 Wp PV array which can deliver about 140,000 litres (37,000 US gal) of water per day from a total head of 10 metres (33 ft). By 30 September 2006, a total of 7,068 solar PV water pumping systems had been installed, and by March 2012, 7,771 had been installed. Solar driers are used to dry harvests before storage. Bangalore has the largest deployment of roof top solar water heaters in India. These heaters generate an energy equivalent of 200 MW. Bangalore is also the first city in the country to put in place an incentive mechanism by providing a rebate of 50 (81¢ US) on monthly electricity bills for residents using roof-top thermal systems. These systems are now mandatory for all new structures. Pune has also recently made installation of solar water heaters in new buildings mandatory. Land is a scarce resource in India and per capita land availability is low. Dedication of land area for exclusive installation of solar arrays might have to compete with other necessities that require land. The amount of land required for utility-scale solar power plants — currently approximately 1 km2 (250 acres) for every 20–60 MW generated — could pose a strain on India's available land resource. The architecture more suitable for most of India would be a highly distributed set of individual rooftop power generation systems, all connected via a local grid. However, erecting such an infrastructure, which does not enjoy the economies of scale possible in mass, utility-scale, solar panel deployment, needs the market price of solar technology deployment to substantially decline, so that it attracts the individual and average family size household consumer. That might be possible in the future, because PV is projected to continue its current cost reductions for the next decades and be able to compete with fossil fuel. Government can provide subsidies for the production of PV panels, in which there will be reduction in the market price and this can lead to more usage of solar power in India. In the past three years, solar-generation costs here have dropped from around 18 (29¢ US) a kWh to about 7 (11¢ US) a kWh, whereas power from imported coal and domestically-produced natural gas currently costs around 4.5 (7.3¢ US) a kWh and it is increasing with time. Experts believe that ultra mega solar power plants like the upcoming world’s largest 4,000 MW UMPP in Rajasthan, would be able to produce power for around 5 (8.1¢ US) a kWh. 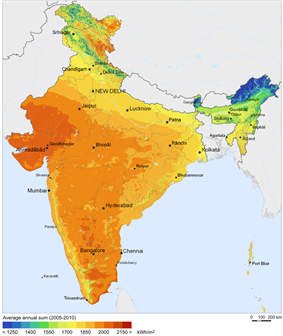 Some noted think-tanks recommend that India should adopt a policy of developing solar power as a dominant component of the renewable energy mix, since being a densely populated region in the sunny tropical belt, the subcontinent has the ideal combination of both high solar insolation and therefore a big potential consumer base density. In one of the analysed scenarios, India can make renewable resources such as solar the backbone of its economy by 2050, reining in its long-term carbon emissions without compromising its economic growth potential. 51 Solar Radiation Resource Assessment stations have been installed across India by the Ministry of New and Renewable Energy (MNRE) to monitor the availability of solar energy. Data is collected and reported to the Centre for Wind Energy Technology (C-WET), in order to create a Solar Atlas. The government of India is promoting the use of solar energy through various strategies. In the latest budget for 2010/11, the government has announced an allocation of 1000 crore towards the Jawaharlal Nehru National Solar Mission and the establishment of a clean energy fund. It is an increase of 380 crore from the previous budget. This new budget has also encouraged private solar companies by reducing customs duty on solar panels by 5% and exempting excise duty on solar photovoltaic panels. This is expected to reduce the cost of a roof-top solar panel installation by 15–20%. The budget also proposed a coal tax of US$1 per metric ton on domestic and imported coal used for power generation. Additionally, the government has initiated a Renewable Energy Certificate (REC) scheme, which is designed to drive investment in low-carbon energy projects. The Ministry of New and Renewable Energy provides 70 percent subsidy on the installation cost of a solar photovoltaic power plant in North-East states and 30 percentage subsidy on other regions. The detailed outlay of the National Solar Mission highlights various targets set by the government to increase solar energy in the country's energy portfolio. The Mysore City Corporation has decided to set up a mega Solar power plant in Mysore with 50% concession from the Government of India. The Maharashtra State Power Generation Company (Mahagenco) has made plans for setting up more power plants in the state to take up total generation up to 200 MW. Delhi Metro Rail Corporation plans to install rooftop solar power plants at Anand Vihar and Pragati Maidan Metro stations and its residential complex at Pushp Vihar. Reeling under an acute power crises, the Government of Tamil Nadu has recently unveiled its new Solar Energy Policy which aims at increasing the installed solar capacity from the current approximate of 20 MW to over 3000 MW by 2015. The policy aims at fixing a 6% solar energy requirement on industries and residential buildings for which incentives in the form of tax rebates and current tariff rebates of up to Rs.1 / unit will be applicable to those who comply with the Solar Energy Policy. The policy also gives an option to those industries/buildings who do not want to install rooftop solar photo-voltaic systems to invest in the government's policy and be given the same incentives as explained above. ^ MNRE Releases JNNSM Phase 2 Draft Policy Report; Targets 10 GW of Utility Scale Solar Installations - Renew India Campaign - solar photovoltaic, Indian Solar News, Indian Wind News, Indian Wind Market. Renewindians.com (2012-12-03). Retrieved on 2013-12-06. ^ "India’s national solar plan under debate". Pv-tech.org. Retrieved 2010-11-27. ^ Nitin Sethi, TNN, 18 November 2009, 12.42am IST (18 November 2009). "1gw solar power in 2013". Timesofindia.indiatimes.com. Retrieved 2010-11-27. ^ Steve Leone (9 December 2011). "Report Projects Massive Solar Growth in India". Renewable Energy World. ^ "World’s largest Solar Plant to be installed in Rajasthan". Retrieved 22 September 2013. ^ India’s first solar PV project registered under the CDM | For the Changing Planet. Greencleanguide.com (2011-09-24). Retrieved on 2013-12-06. ^ "(look for heading: Solar Photovoltaics)". Renewing India. Retrieved 2010-11-27. ^ "Solar". Ministry of New and Renewable Energy, Govt. of India. Retrieved 21 February 2014. ^ "Status of Solar Energy in INDIA – 2010". Retrieved 2011-03-01. ^ a b c d e f Roul, Avilash (15 May 2007). "India's Solar Power: Greening India's Future Energy Demand". Ecoworld.com. Retrieved 2012-02-28. ^ Chittaranjan Tembhekar (26 October 2009). "India tops with US in solar power". Economic Times. ^ "Physical Progress (Achievements)". Ministry of New and Renewable Energy, Govt. of India. 31 January 2014. Retrieved 21 February 2014. ^ "Gujarat flips switch on Asia’s largest solar field, leading India’s renewable energy ambitions". Washington Post (New Delhi, India). 2012-04-19. ^ "Neemuch Solar Plant inaugurated by Narendra Modi and MP CM Shivraj Singh Chauhan". Retrieved 7 September 2014. ^ "Green Energy Corp to set up 50 mw Solar Power Plant". Odisha Sun Times (Bhubaneswar, India). 2013-12-05. ^ "NTPC's 50 MW solar power plant in Madhya Pradesh commissioned". Economic Times. Retrieved 12 September 2014. ^ "Welspun Energy commissions largest solar project". Economic Times (Jaipur, India). 2013-03-12. ^ "Odisha to float tenders soon for 48 Mw solar power". Business Standard (Bhubaneswar, India). 2011-12-30. ^ "Adani Group commissions largest solar power project". Economic Times (New Delhi, India). 2102-01-05. ^ "Reliance Power to Buy First Solar Panels for U.S.-Backed Project". Bloomberg (India). 5 September 2011. ^ "Moser Baer commissions 30-MW solar farm in Gujarat". The Hindu. 12 October 2011. ^ "GEDCOL seeks land transfer for 20 Mw solar plant". Business Standard (Bhubaneswar, India). 2014-04-01. ^ "World-Bank Backed Azure Starts Up Solar-Power Plant in India". Bloomberg. 8 June 2011. ^ "Mahindra Solar Rajasthan unit on stream". The Hindu (India). 10 January 2012. ^ Jaishankar, C. (23 December 2010). "Solar farm launched in Sivaganga district". The Hindu (Chennai, India). ^ "Conergy deploys 3 MW solar PV power plant in India". renewableenergyfocus.com (Itnal, Belgaum District, Karnataka, India). 21 April 2010. ^ "Karnataka gets India's first 3 MW solar plant". Deccan Herald (Kolar, India). 17 June 2010. ^ "Tata BP Solar installs first plant in Tamil Nadu". The Times Of India. 8 July 2011. ^ "Chemtrols Solar Successfully Commissions A 1 MW Solar PV Project In Gujarat". EAI (Patdi, District Surendranagar in Gujarat, India). 18 January 2012. ^ Solar Lights, Solid Solar, Solar Street Light, Solar Lantern, Solar Home Light, Solar Light. Gautampolymers.com. Retrieved on 2013-12-06. ^ Zynergy Projects to invest Rs 5000 cr in solar projects. Business Standard (2012-03-13). Retrieved on 2013-12-06. ^ . AP TransCo Retrieved on 2013-12-06. ^ a b Rajasthan is second state to cross 500MW capacity mark. PV-Tech. Retrieved on 2013-12-06. 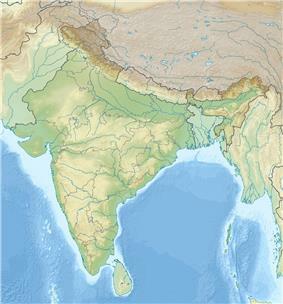 ^ AREVA : India: AREVA to Build Asia's Largest Concentrated Solar Power Installation. 4-Traders. Retrieved on 2013-12-06. ^ AFP: French group Areva to build big Indian solar power plant. Google.com (2012-04-11). Retrieved on 2013-12-06. ^ a b c "India Readies Big Move Into Solar Energy". The Wall Street Journal. 13 December 2013. Retrieved 21 February 2014. ^ "Shirdi Gets Largest Solar Cooking System". ^ "Shirdis solar cooker finds place". ^ "Shirdi Gets worlds largest solar steam system". ^ "India’s largest solar plant in MP, Modi calls it ‘saffron revolution’". ^ "Ujaas Sees Revenue Growth on Solar-Plant Sales". ^ "Past market size for solar home lighting systems and lanterns in India [loopsolar.com, India, 84794]". loopsolar.com. Retrieved 2014-04-17. ^ "India ranks number one in off-grid business indicators across Asia [loopsolar.com, India, 84794]". loopsolar.com. Retrieved 2014-05-07. ^ "Solar power in 3,000 Orissa villages by 2014 [newkerala.com, The Netherlands, 84794]". Newkerala.com. Retrieved 2010-11-27. ^ "The Orissa Renewable Energy Development Agency (OREDA) was constituted as a State Nodal agency in the 1984". Oredaorissa.com. Retrieved 2010-11-27. ^ by panchabhutha. "orissa « Panchabuta – Cleantech & Renewable Energy in India". Panchabuta.wordpress.com. Retrieved 2010-11-27. ^ "The Energy Business – India Energy News, Nuclear Energy News, Renewable Energy News, Oil & Gas Sector News, Power Sector News » Orissa approves nine solar power projects". Energybusiness.in. Retrieved 2010-11-27. ^ "Solar chilli drier". Informaworld.com. 1 September 2005. Retrieved 2010-11-27. ^ "Solar Water Heater". Dnaindia.com. 28 November 2009. Retrieved 2010-11-27. ^ "Solar Water Heater Rebate". The Hindu. 26 November 2009. Retrieved 2012-04-25. ^ Dipannita Das, TNN, 29 November 2009, 04.34am IST (29 November 2009). "More homes opt for solar energy". Timesofindia.indiatimes.com. Retrieved 2010-11-27. ^ "Price Quotes". http://pv.energytrend.com/. Archived from the original on 26 June 2014. Retrieved 26 June 2014. ^ Press release - 13 April 2007 (13 April 2007). "Energy (R)evolution: A sustainable Energy Outlook for India". Greenpeace.org. Retrieved 2010-11-27. ^ a b Press release - 9 April 2007 (9 April 2007). "Greenpeace announces comprehensive energy strategy for India to tackle Climate Change without compromising economic development". Greenpeace.org. Retrieved 2010-11-27. ^ "NASA population density map". Visibleearth.nasa.gov. Retrieved 2010-11-27. ^ a b "Energy-Atlas Solar radiation". Retrieved 2010-11-27. ^ "Regional and World Energy-Maps of Solar radiation". Meteonorm.com. Retrieved 2010-11-27. ^ "Solar LEDs Brighten Rural India's Future". Treehugger.com. Retrieved 2010-11-27. ^ Dutt, Ram (5 September 2004). "Solar plan for Indian computers". BBC News. Retrieved 2010-11-27. ^ "Barefoot solar engineers". Worldchanging.com. 22 February 1999. Retrieved 2010-11-27. ^ "Solar powered rickshaw". Speedace.info. Retrieved 2010-11-27. ^ "MCC plans to burn midnight oil the solar way". ^ Wadke first=Rahul (2012-05-17). "Maharashtra plans 4 more solar plants of 200 MW by 2015". ^ "Delhi Metro to install three new solar power plants". IANS. news.biharprabha.com. Retrieved 3 July 2014. ^ "Tamil Nadu unveils a new Solar Energy Policy aims at increasing Solar Power generation to 3000MW by 2015".